Ostara is the celebration of the Spring (Vernal) Equinox when day and night balance. Astronomically, the sun crosses the celestial equator at this time. Held in late March, the actual date can vary from year-to-year as with the Autumnal Equinox and the two Solstices. The Vernal Equinox usually falls on March 20 or 21. Always check your almanac for your time zone. It is the fertility of the Earth that we celebrate, and we symbolize this new life springing from sun and soil with eggs, chicks, lambs, and rabbits (all symbols of the Great Mother). Eostre is the Goddess of dawn and new beginnings. Her name is similar to the word for the Christian Easter, because that holiday took its name from the ancient Pagan Goddess of Spring and rebirth. Another name in the same family is Ishtar, the Babylonian Goddess of the forming and evening stars. 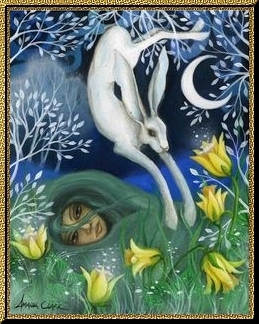 Eostre’s sacred animal is the rabbit or hare. Rabbits bear young in the springs, and have come to represent fertility and abundance. Hares, which are bigger and wilder than rabbits, have long been identified with magic, the springs, and the mysteries. Hares are associated with the moon – the ancients saw the “rabbit in the moon”, today known as the “man in the moon”. The other Goddess we associates with the Spring Equinox is Kore or Persephone, daughter of Demeter, the Greek Goddess of grain and growing things. In the Spring, Persephone comes back from the Underworld to be reunited with her mother. A part of the Goddess that has been sleeping all winter reawakens with the warming of the ground of springs. She who has been mother, midwife, and teacher through the winter now welcomes back her own daughter-self, the Maiden of Springs. At this time of balance the Goddess is Mother and Daughter both. The God of Springs is the young God, playful and joyful, the trickster. He is the spirit of everything that is joyful, light, and changeable. Born at Winter Solstice, nurtured at Imbolc, now he’s like a young and mischievous child, still wild and new. He is raw, creative energy that has not yet been harnessed, tamed, civilized. He sees with clear eyes and does not hesitate to announce that the emperor is naked. He deflates the pompous and laughs at self-importance. The trickster is an important spirit power in many earth-based cultures. To many of the Native American tribes, he is Coyote. To the First Nations of the Northwest Coast, he is Raven, who creates the world. In parts of West Africa, he is Elegba, the small child-God who as a point of light constantly runs circles around the universe. To early African-Americans, he is Brer Rabbit, who tricks his way out of trouble. In European earth-based traditions, he is the Fool of the Tarot, who leaps blithely off a cliff as he follows a butterfly, yet always lands on his feet, because he takes himself lightly. He is spirit taking the plunge into matter, idea manifesting as form. He is Robin Goodfellow, shape shifter and wood sprite, child of the Faery King. He comes to us in the springs when all of nature is shifting and changing: seeds poking out sprouts, butterflies emerging from cocoons, tadpoles growing legs and turning into frogs. We celebrate him on the Spring Equinox, but of course, his proper holiday comes shortly after, on April Fool’s Day. In his honor, we play tricks on one another. The altar for springs includes — what else?– images of rabbits and birds, eggs of all sorts, nests, flowers, and living plants. If you like to keep your altar up for a long time, blow your eggs after you’ve colored them. Take a small branch from a tree and hang the eggs from it. Start some seeds, to be planted out in the garden, and let your seed trays become the basis for your altar. Water them every day, talk to them, and watch them grow. All pastels are appropriate for Ostara — especially the greens, yellows, and pinks. White makes a nice accent, but seems too sparse for an altar cloth representing the season of growth and fertility. If you want to use wood in your spells and rituals, ash has a strong ling with the equinox due to its connection with the macrocosm-microcosm concept in the Celtic ogham runes – the balance of light and dark… as above, so below. What better day to decorate for the springs season than with the flowers that blossom at this time? They are abundant and beautiful. Daffodils, jonquils, tulips, narcissus, violets and crocus and snowdrops – fill the house with their color after you’ve finished your spring cleaning. Take regular walks around your neighborhood, looking and listening for signs of spring: the fattening leaf buds on trees, the first flowers of spring, the first Robin. Think about the Earth’s movement toward greater light and less darkness.